Thanks for taking the time to share this offer gregrooney I've got a V6 and I use it more now than my normal Dyson upright, very quick and easy to use. 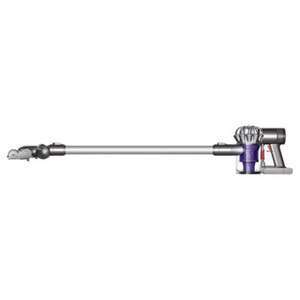 Are these Dyson cordless vacuums actually any good, Anyone used one, are they powerful as been thinking of getting one. Do they have to be fixed to a wall to charge, not big on idea of a vacuum attached to my wall. I'm not a Dyson fan as in my opinion the upright vacuums are over priced and badly made with cheap plastics. For anything of decent power or put together well you have to sell a an organ. Always thought cordless vacuums of any make would be poor performers as the power is just not there. The wife tho thinks these could be a good addition to our house so If anyone has one of these cordless Dyson vacs i would be interested in your thoughts on its performance etc and is this a good price or is they anything better out there. Is this a deal? Isn't it this price on the Dyson website? I've recently inherited a used one which I think is great. It won't replace your normal vacuum but it is very powerful considering its size. I have the same model as the op and I can vacuum my whole house daily on one charge. It works well on laminates and carpet and you'll be surprised how quickly it fills the bin up. I don't think this particular floor head is good on tiles especially if you have a few water drops on the floor. I've not really had to use the boost function but using that on carpet I find it very difficult to push as the suction is great. The fact that this is cordless will mean you'll be vacuuming a lot more in short bursts without realising it, and that leads to a cleaner home as you're not having to lug the larger machine out, plug it etc. The bin needs emptying frequently as its quite small but overall its fairly light so doesn't cause as much strain as some other cordless models. You don't have to attach to the wall but it makes storing it a lot easier and charging. We don't actually have the wall mount so just plug the charger directly into the unit. Personally I would recommend it as it means that all my family now vacuum up I'd they make some mess and you can quickly do main areas with ease. This is my personal view on the product having owned one for approx 2 months now and in that time I've only used my big vacuum about 4 times when doing a deep clean. I hope that helps. That's a Dyson vacuum, NOT a Hoover! I purchased this model around a month ago after seeing it on here. I was extremely dubious over how well it works but I have got to be honest, I think it is brilliant. In fact it is better than that. It only has 20mins of use on the regular power and 6 minutes on the full power. The regular suction works fine and the powerful suction is fantastic but I do not see this as a " do your whole house" kind of vacuum. This is because it is so easy to pick up and use that it can be used as an when. I have hung it on the wall in the utility room and grab it when ever it is needed. When the upstairs needs doing I grab it and do it and the same for the living room and kitchen. I struggle to see how we would go back to a corded vac now. So all in all, I would highly recommend it. What's the difference between this and the V6 trigger? Is it the long pole? V6 Trigger is only £129. What's the difference between this and the V6 trigger? Is it the long …What's the difference between this and the V6 trigger? Is it the long pole? V6 Trigger is only £129. Yes it is the long pole I believe. How much space does this take up if wall mounted? Deal posting newbie! This is gregrooney first deal post. Help out by leaving a posting tip or just to show your appreciation for their contribution.